Last week, it was time once again for the International Search Summit @ SMX Munich, which was a day filled with insights, ideas and tactics for the international web marketer. My role there was organiser rather than blogger, so the need to pop out of the room to check the internet connection, call a speaker and make sure lunch was being served (very important! ), meant I wasn’t able to hear all the speakers in full. But I certainly heard enough to share some of the key takeaways and insights from the day. Webcertain‘s Andy Atkins-Krüger presented his 10 critical success factors for international search, which covered everything from translation to geo-targeting to content processes. However, despite there being 10 factors, Andy claimed that number 1 – research is about 50% of the importance. He advocated doing the research before you make any decisions about target markets – discover potential pitfalls, challenges and opportunities before you waste time and money going down the wrong route. As always, Brett from GlobalWebIndex presented some fascinating data, collected from their surveys into the online and offline behaviours of over 180,000 people in 31 countries. When asked “Which online sources do you primarily use when actively looking to find out more information?”, search was the most popular answer with 41%; almost double any other channel. The slide below is taken from Brett’s deck, and shows the responses by country. 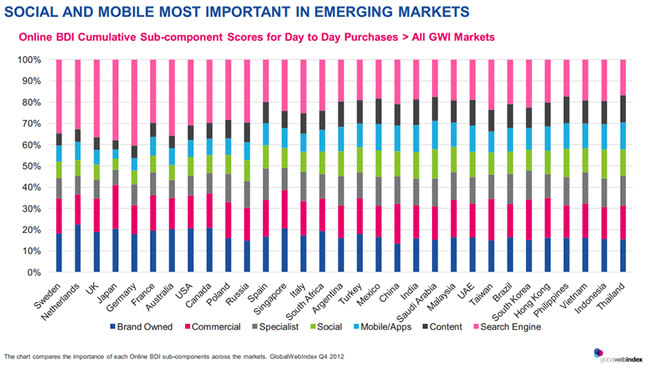 As well as showing the dominance of search, it also highlights the fact that social and mobile are more important in emerging markets, such as Brazil, Thailand and Indonesia compared to developed markets like Japan, France and the UK. Despite continual debate over the usage, and value of Google+ , the data from GlobalWebIndex confirms that Google is the second most popular social network after Facebook, with 359 million active users worldwide. Hard to believe maybe, but the data backs it up. And Google’s John Müller touched briefly on Google+ during a Q&A session, saying that there is still a lot going on behind the scenes, and we should expect to see Google+ playing more of a role in search results. Well, that’s what they say anyway. Google might dispute this and some sources report that Google did overtake the local Czech engine – but whatever the actual numbers, both search engines have a significant number of users and to succeed in that market, organisations need to be visible on both. Speaking for the first time at an ISS event, representatives from Seznam explained how they believe that it is its exclusive focus on the Czech market which enables it to compete with Google, so don’t expect Seznam to follow the lead of Baidu and Yandex and venture into new countries. When asked how Seznam differentiates itself from Google, the answer was that they run their own search index and don’t rely on Google’s (or another’s) technology to so. And the Googler on the panel had to agree that it is better for users in a market, when there is a local search engine running its own index. No doubt you’ve been href-lang’ed to death now, but Google is further developing its mark-up for international sites with the introduction of the x-default . At ISS John announced the release of this new attribute, which enables webmasters to indicate a page which doesn’t target any specific language or region. Google will then show this page as a default when there is no appropriate local page for a user. X-default is also supported by Yandex. Heavily promoting a product 2 years before it’s released isn’t a common tactic, but it’s exactly what BMW decided to do for their new electric car sub-brand, BMWi. Martin Assmann from iCrossing explained that when running a Twitter campaign, with the slogan #bornelectric, they realised that they were getting a lot of traffic from Lady Gaga fans, thanks to her Born This Way. Realising there was opportunity for massive exposure they turned #BornElectric into a promoted trend on Twitter for 24 hours and saw massive engagement from around the world – from retweets, to replies to piggy backing from other brands such as General Motors. Martin’s advice was to think outside the box and always look out for hidden opportunities. So there you have it. A few things to be thinking about when you’re working on your international strategy and putting your global plans into action. And if that’s not enough, watch this space for updates from next month’s International Search Summit London!